A special Sports Meet for children with special needs was held in Mullaithivu recently. 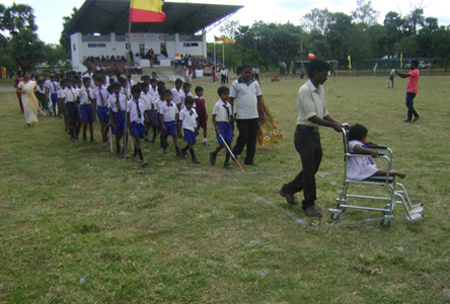 Differently able children from Thunukkai and Oddusuddan areas gathered at the Oddusudan Maha Vidyalayam playground to take part and enjoy the various sports activities organized for their sheer pleasure and enjoyment. 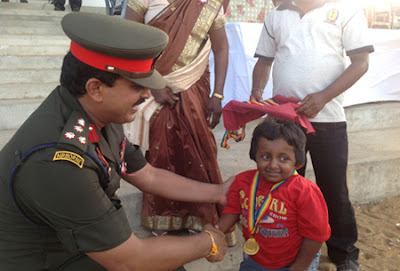 This social service initiative was organized by the troops of the 64 Division of the Sri Lanka Army in Mullaithivu. Most of these children are from low income families. 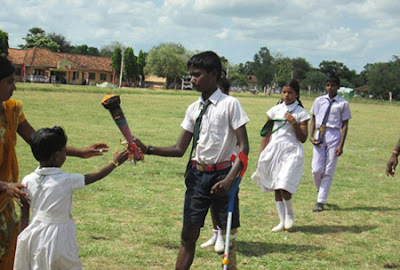 Their performance in spite of their disabilities demonstrated their innate talents and will to face challenges of life. Their display of sportsmanship and camaraderie was an inspiration to others who had gathered at the venue to witness this unique event. Medals, certificates and gifts were also awarded to the participating children. 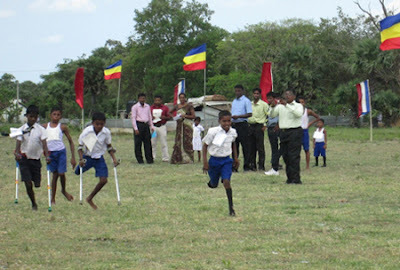 Meanwhile a 'Big Match' was also held for the first time between Oddusudan Maha Vidyalayam and Vidyananda Maha Vidyalayam in Mullaithivu under the aegis of security forces in Mullaithivu. Security forces had in recent times have taken special measures to promote sports among the northern youth. In addition to distributing sports equipment special coaching camps are also organized for the school children. Furthermore once abandoned and dilapidated sports facilities have been given a new lease of life under a security forces initiative to promote sports in the region. Such an event would not have materialized if it wasn't for the timely action of the security forces. Since the end of the humanitarian operations in 2009 the security forces have embarked on another mission to assist the people of the north and east to rebuild their lives. They are extensively involved in a number of major infrastructure development projects carried out under the reconciliation process. In addition they also conduct programmes to uplift the life of the resettled community especially in education, health, woman empowerment, skills development and self employment sectors. Senior security forces officers, government officials, teachers, parents and well-wishers were present at the occasion.